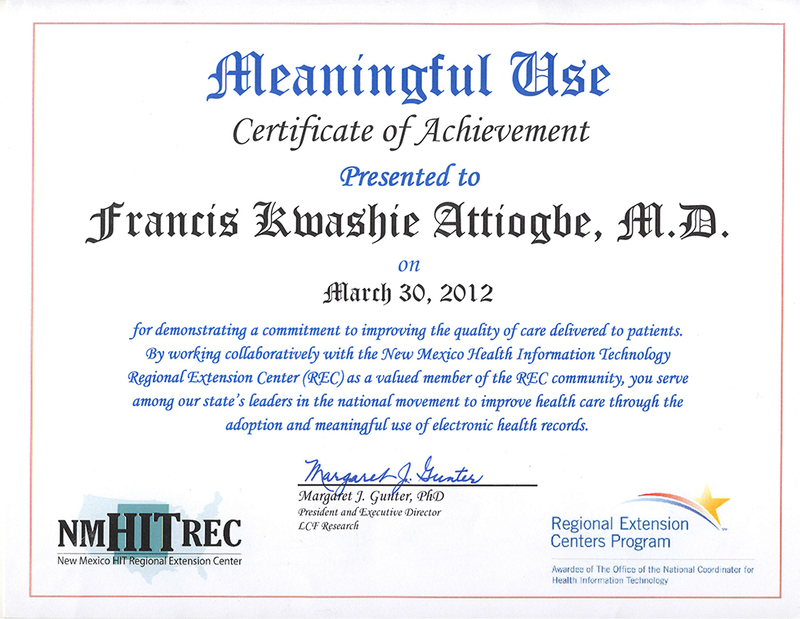 Dr. Francis K. Attiogbe FESSS Family health care of Las Cruces has joined the ranks of New Mexico health care providers who have achieved the status of Meaningful Users” of electronic health records (EHR) according to standard set by the Center for Medicare & Medicaid Services (CMS). By utilizing EHRs, providers can offer higher quality, safer care and create tangible improvements to their practices, allowing them to make better clinical decisions, provide more coordinated care and increase efficiency in their offices. On behalf of NM HITREC, we congratulate Dr. Attiogbe and his Staff on their achievement. We commend them for being at the forefront of Meaningfully using an EHR and hope their experience will encourage other clinicians to follow their footsteps.